Clip clop. Clip clop. In case you've been missing the sound of hooves on pavement, the horses are back at Disneyland. The horse-drawn trolley is one of the few Disneyland attractions that's been operating since opening day in 1955, carrying park visitors up and down Main Street USA nearly every day for more than 60 years. That was until Jan. 8, when they went on hiatus while Disney workers repaired the tracks. People who are particular fans of the Disneyland horses were on hand Thursday to greet the animals as they once more began their route up and down Main Street, shuttling passengers slowly up to Sleeping Beauty Castle, and then back again. "It's excellent, everyone's super-excited to have them back," said Lisa Gleim, a Disneyland employee who oversees the streetcars and the horse barn. She was out helping load passengers Thursday morning, and making sure all was well. Disneyland annual passholder Vickie Coleman of Long Beach even called her boss and asked for the day off, when she got a text at 7:30 a.m. that the streetcars would begin operating again. "I called my boss and said, "Do you mind if I take a vacation day? I'm sorry it's short notice.'" Coleman and her husband, Michael Deluca, are particular fans of the 18 Disneyland horses whose job it is to pull the trolleys. They know all their names, breeds and markings. 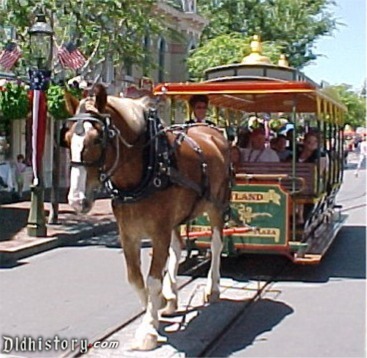 The horse-drawn trolley was important to park founder Walt Disney as a symbol of small-town, turn-of-the-century America that he wanted to replicate on Main Street USA. But the animals are also a huge draw, especially for children. "They had a horse out for petting the other day, and it had longer lines than Mickey Mouse," Deluca said. "They're incredibly good with children." Disney workers spent nearly three months renovating the elderly rail track system that the trolleys use along the pavement, repairing them for safety reasons and adding a ribbon of 50,000 bricks, which are not only decorative but also are better for the horses' hooves to walk on. During the renovations, visitors saw wooden barriers lining the middle of Main Street. The renovations also put a temporarily halt to the nightly parades. No one's allowed to pet the steeds while they're working, but they seemed content to be back on the job, trudging 3,500 feet - about two-thirds of a mile -while hauling up to 24 visitors at a time. Disneyland also operates other vintage vehicles, including a fire engine, omnibus and horseless carriage, which have also returned to operation. But the horses have a special appeal. Tim and Cheryl Daniel of Sanger were riding the trolley Thursday morning, unaware that they were among the first visitors to experience the new tracks. Cheryl Daniel said they like the horses because she and her husband were raised on farms, and they enjoy seeing the children respond to them, knowing that some may never have seen a live horse. After more than 60 years of walking the same route, up Main Street to the hub in front of the castle and then looping around for the return, the horses now walk a figure-8, with a new track design. This means that they make the same number of turns on their left side as right, saving wear and tear on the trolley and the harnesses, and also providing a more balanced amount of exercises for the animals themselves. "They pull from their shoulders, and we wanted them to start pulling left (as well as right)," Gleim said. "For their health, to balance them out." The horses, which are large, beautiful draft breeds such as Percheron, Shire and Brabant have been practicing their new route early in the morning, before the park opens. She said that the horses - mostly geldings - typically work three hours per day, three days per week, during the daytime. When it's too hot, the horses retire and the streetcar doesn't run. The horses were formerly stabled at the park, but now that area is under construction to become Star Wars: Galaxy's Edge land, so they have a new home at Circle D Ranch in Norco. "They had to retrain them to teach them to go in this new pattern," Coleman said. "Some were more stubborn than others."